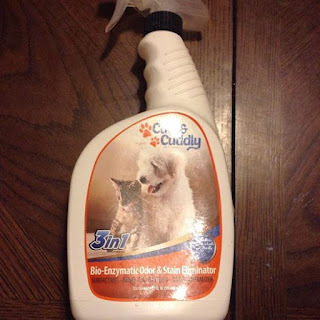 This is my all time favorite pet odor and stain remover for scent alone, safe for pets and children. It also works great on stains which is a real lifesaver with a Giant Saint Bernard, 3 cats, plus another one that comes in with ours from time to time, 2 birds, fish, and hermit crabs. Easy to use by spraying on the stain or odor and then dabbing up or in our case we add it to the cleaning solution area of our steam cleaner for super easy clean up. Very happy with this product. Comes with a closed cap, and a spray nozzle which you attach. This Odor and Stain remover can be found on Amazon. What Cute and Cuddly Pet Supplies has to say about their product. ENJOY YOUR HOME AGAIN WITHOUT THE BAD SMELL - Some people say it smells like dog. To others, it smells like wet dog, cat pee, or even feet. However, it's not pleasant for your home to smell that way. With our urine odor neutralizer and stain cleaner , your home doesn't have to smell like that forever! PREVENT FUTURE URINATION - Pets are more likely to urinate indoors when an animal scent is already there from pee pee. Our product can effectively neutralize urine crystals and acts as both pheromone diffuser and a pet repellant, making sure your pets won't wee in the same place again. WORKS IN CARS, TOO - Did a nervous peeing dog or cat on the way to their grooming appointment stain your automotive upholstery? No need to worry! 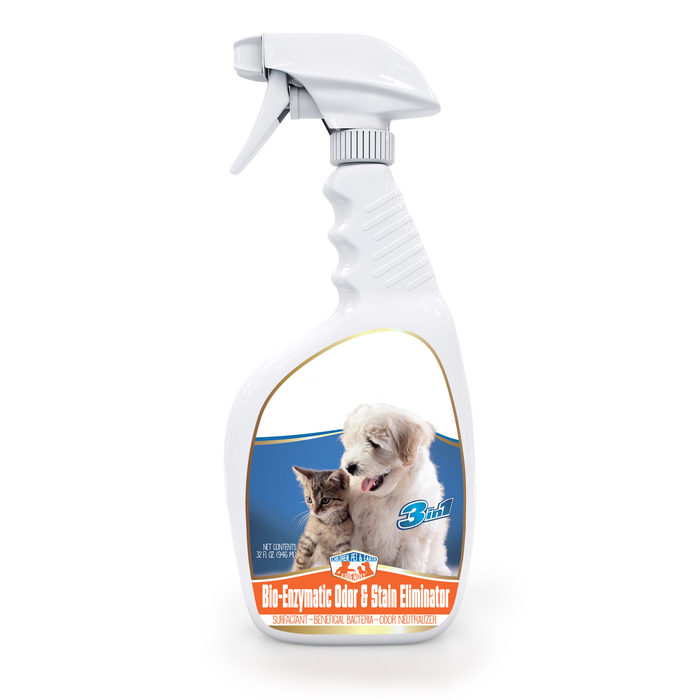 Our sprayer works as an upholstery cleaner for your pets' urine and a pee remover, too! Get the smells and stains out of your car for good. WORKS BETTER THAN LEADING BRANDS AT A FRACTION OF THE COST - Our spray works better than leading cleaners like Bissell, Gonzo, Resolve, Shout, Odoban, Zout, Fizzion, Chem Dry, Mary Ellens, and Fresh Wave to permanently eliminate stains and odors naturally. And it does this at a fraction of the cost! CONVENIENT 32 OZ. SPRAY BOTTLE - Our urine cleaner and bad smell eliminator doesn't require any other cleaning equipment to make sure smells and stains are gone forever. If you need a severe urine neutralizer, simply use our product on carpets, furniture, enclosures, or in dog or cat cages. Disclosure: MarksvilleandMe received one or more of the products mentioned above as part of a promotion with Tomoson and Cute and Cuddly Pet Supplies. Regardless, MarksvilleandMe only recommends products or services we use personally and believe will be good for our readers. Some of the links in the article may be “affiliate links.” This means if you click on the link and purchase the item, I will receive compensation. If you would like MarksvilleandMe to review a product or service please contact us at marksvilleandme@gmail.com.